I LOVE creepy and scary places. I love horror movies, suspense thrillers, anything that has a dark undertone to it. 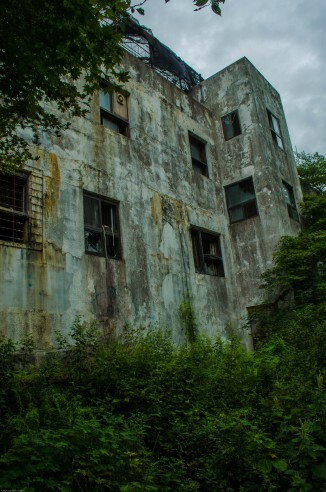 And since I travel a lot, I like to fit in some visits to creepy places if I am anywhere near them. 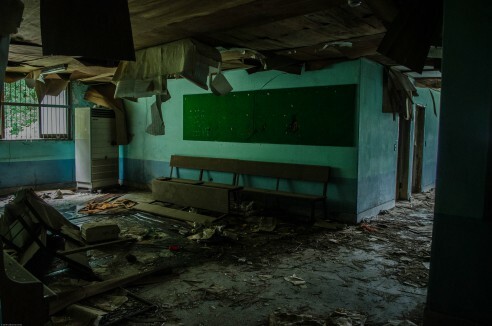 Granted, most creepy places seem to be off the beaten track and are not that easy to get to. But when the opportunity presents itself, I have a hard time saying no. 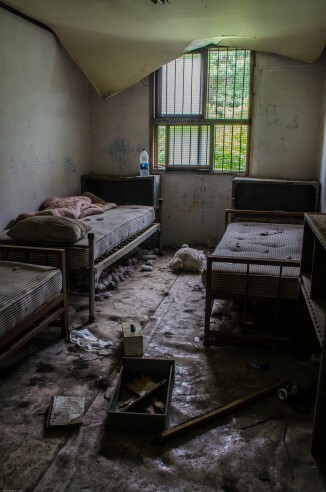 I first learned about Gonjiam Psychiatric Hospital last year when my photography instructor alerted our class and wanted to organize a group trip down there to practice photography. I of course jumped on that, figuring it would be easier to get to in a group, plus there is the whole safety in numbers concept. Alas the group trip fell through, but I vowed that I would visit Gonjiam Psychiatric Hospital before I left Korea last year. After some hemming and hawing (not because I was scared, but more because it is a bit more of a pain to get to on your own without a car), I finally committed myself one weekend to going. It helped that I told an acquaintance I was going, so I wanted a story to tell on Monday. While Gonjiam Psychiatric Hospital is pretty easy to get to in a car, being only a 40 minute drive south of Seoul, it is a bit more complicated to get via public transportation. But it can be done as I demonstrated. 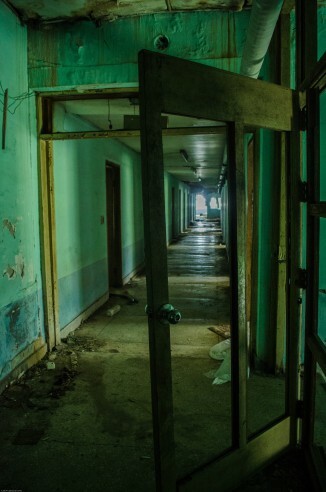 Most people I know don’t do a whole lot of traveling on their own, and I know none of them who would go visit an abandoned psychiatric hospital on their own, particularly one that often makes the list as one of the creepiest places on Earth. But hey, it’s one of those things where I knew if I waited for someone to go with me, I would never go. So I resolved to go on my own. I researched the hell out of this trip before I went alone. I read nearly every newspaper article and blog post about it (there aren’t THAT many) to fully understand how to get there. Because the hospital is located in a residential area (though a reasonably isolated one), and the hospital has such a creepy reputation, I read that the locals aren’t that forthcoming with the directions. Luckily for me, I found one blog that gave pretty good directions to the hospital (as good as you can give), along with the most helpful thing- the Google navigation coordinates and those would prove immensely helpful for me when I was actually navigating there. 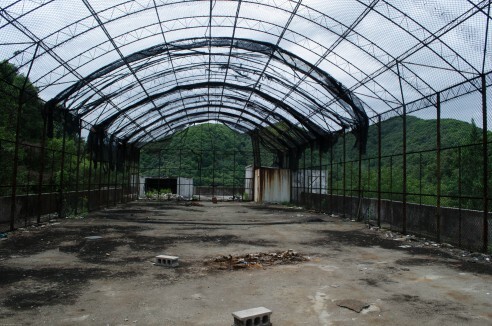 There are a couple of ways to get to Gonjiam, and getting to the town itself is not that difficult. I chose to take Bus 1113-1 from Gangbyeon Station, Exit #1. The ride itself will take around an hour, maybe more depending on traffic. This humid, overcast August Sunday was fairly sparse for traffic, so it didn’t take too long. The hardest part was to know which stop to get off. None of the directions gave a specific bus stop, just started their directions from the center of town. So I sort of miscalculated where to get off, and ended up getting off at a bus stop on the way out of town. This is when the Google coordinates saved my trip, because I honestly never would have found the hospital without them. I can’t give really good directions only because I didn’t follow a straightforward path. Because I was basically cold navigating off Google Maps, it took a bit more time to find my way there, but soon I saw the directions in the blog posts I researched and knew I was on the right track. And then- BAM! There it was off to my right, the entrance to the hospital road. 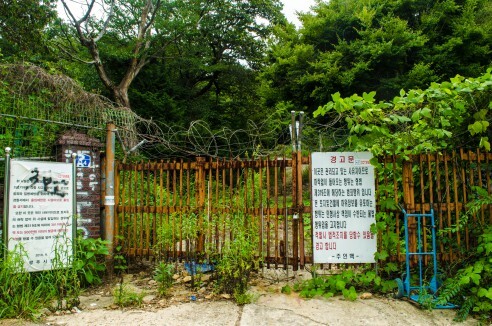 It is completely gated off with concertina, CCTV cameras and signs in Hangul and English warning trespassers off. However, I knew from my research that it’s not like there were security guards on site to enforce this. Now here is where I SHOULD have rechecked the blog posts for specific directions on how to get into the hospital, but I foolishly thought I remembered everything so I set out walking. I had the basic idea right, but remembered the specifics wrong. I knew I had to walk past the gate and then turn up and walk around. However for some reason, I thought I had to walk farther than I really did, so I ended up wasting at least 30 minutes wandering around in the woods looking for an entrance before giving up and deciding to go back to the gate. By this time, I decided to recheck the blog posts, because I knew I must have missed something. Thankfully Korea is well covered in 4G network for me to access the Internet. So I read just how to get past the gate and felt like an idiot, because it was literally 20-30 meters up the road. Per that trip saving blog post, once at the gate, “continue down the road past the fence for about 20 to 30 meters, you’ll come to a light-coloured building on the roadside. 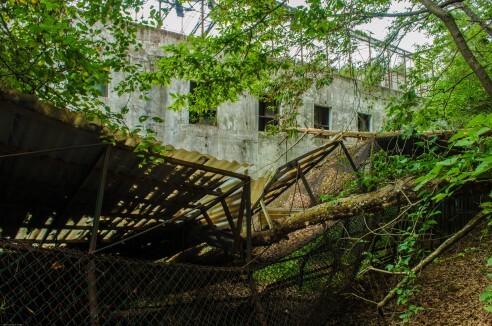 Walk around this building and into its backyard area, following the concrete structure uphill into the woods where a trail will appear. Keep along the trail and, just like the movies tell you not to, you can easily walk through the gaps in the fence.” It is literally that easy and I didn’t run into anyone to stop me. Once you walk through the gap in the fence, you are on the hospital road behind the gate and it is simply a matter of walking a few minutes up the hill to the hospital. It is amazing how the hospital really does look like what you would imagine a creepy, abandoned hospital to be in a horror movie. You just needed some spooky music to complete the tableau. And since I was out there alone, I kept imagining I was in a horror movie, only on my own rather than with a group of clueless friends who are about to get themselves killed. I arrived at the hospital and then spent some time walking around outside the hospital to find the way in, and getting a clue into how nature has started to reclaim the hospital. 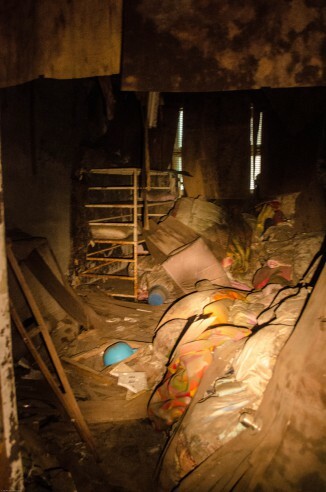 It has been abandoned since 1995, and while urban legend will have it attributed to being haunted from ghosts, other killjoy sites will say it was abandoned for more mundane reasons, such as a problem with the sewer system or it was a financial failure. 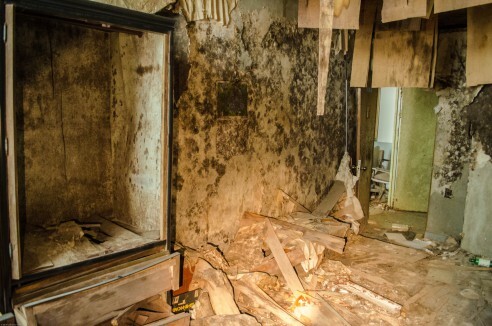 But since I have a dark imagination, I would rather think that the hospital suffered a rash of mysterious deaths in the mid 90s because the clinically insane owner tormented patients and their spirits haunt the hospital to this day. I knew from my research that there wasn’t a straightforward way into the hospital. It was not simply a matter of walking in the front door, because it was locked up pretty tight. 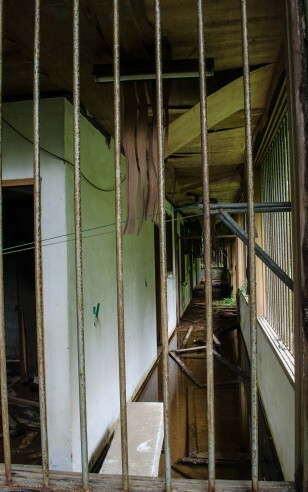 However, previous trespassers had left ways of getting into the hospital. The most recent posts said that there was a ladder that went to an open second floor window. However, that ladder is really no longer necessary. Much to my surprise, you can practically walk through the front door. Or should I say crawl through the front door. The main entrance is covered in rebar, but there is a section on the bottom that allows a human to squeeze through it. I took one final picture of me outside and posted it on social media, so in case I was killed by vengeful spirits of former patients or by a psycho killer hiding on the premises, at least there would be a record of where to find my body. Considering how difficult it was for me to find the actual hospital, I was pleasantly surprised to discover how easy it was for me to actually get into the hospital. 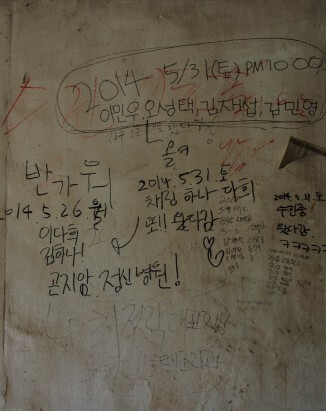 I also saw plenty of graffiti, both in Korean and English, from the thousands of trespassers who blazed the trail for me over the past 20 years. Once inside, I started to explore. There was plenty of sunlight by the entrance, but the farther down the hall I went, the darker and spookier it got. I came equipped with a flashlight and it helped me peer into the open rooms. 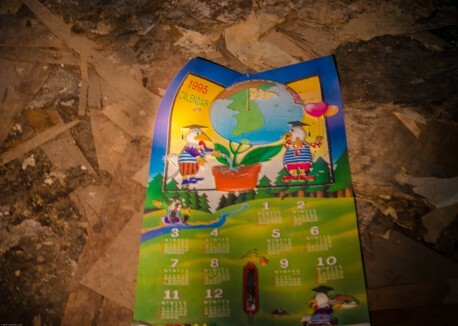 It was strange to see evidence of the fact that the hospital was abandoned 19 years prior, such as a calendar from 1995. 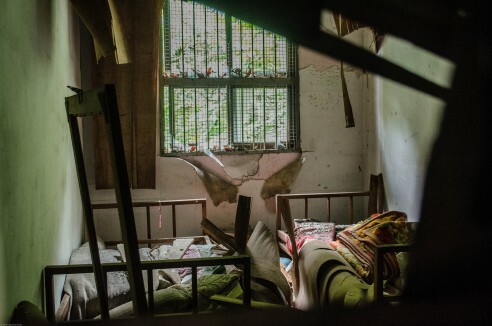 Even if this hospital isn’t truly haunted, it is still a fascinating study of what happens when man made structures are abandoned and returned to nature. 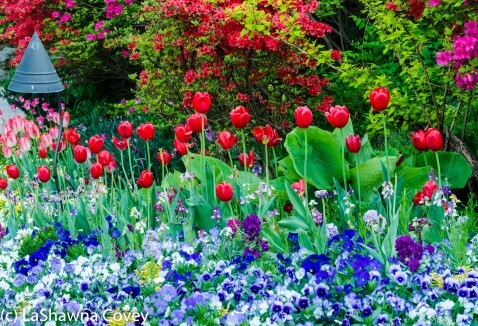 Man may be able to do amazing things, but nature is one powerful beast that will overtake anything given enough time. I mean, nature has reclaimed whole ancient civilizations and buried them under desert sands or lush jungle forests. 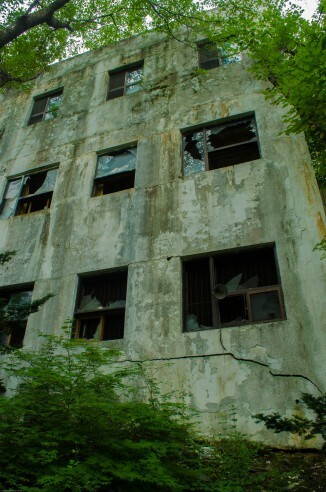 So in the space of 20 years, nature has invaded Gonjiam hospital and is slowly taking it back from man. 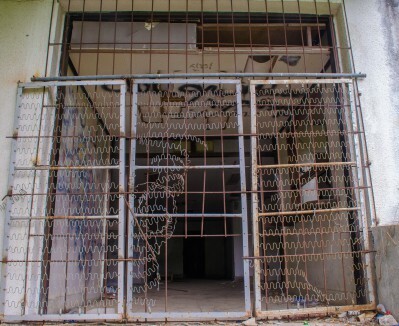 The hospital has multiple floors, but the ground floor was the darkest and the spookiest in many ways. 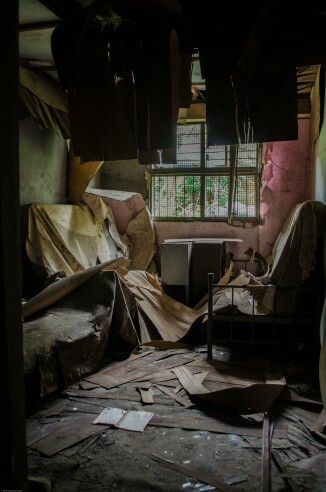 Even if the hospital was abandoned deliberately for practical reasons, it still seemed eerie to see how disheveled the hospital was. 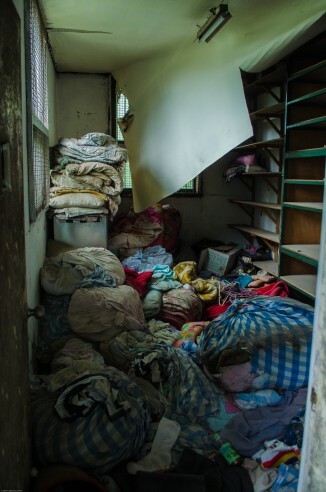 I mean, it’s not like this place was cleaned out in an orderly fashion and all you are seeing are empty rooms. 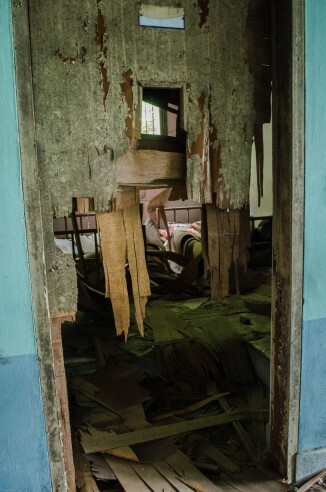 Nope, plenty of furniture was left in the rooms, particularly on the ground floor. 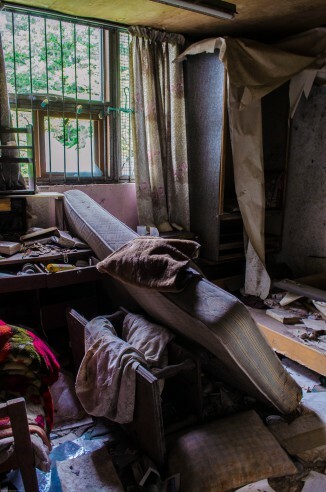 I found room after room where mattresses were stacked, wooden furniture was shoved, old blankets were stuffed, all of it slowly rotting from the influx of weather. 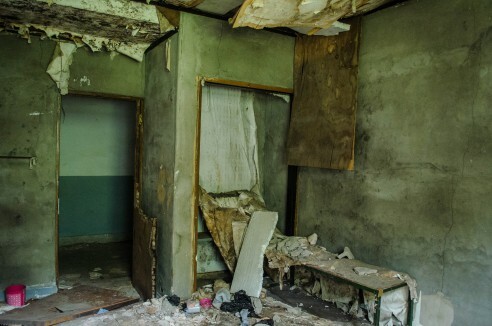 In some rooms, it looked they were still set up for patients, only now nearly 20 years had passed. A good chunk of the windows were broken and there was glass everywhere. 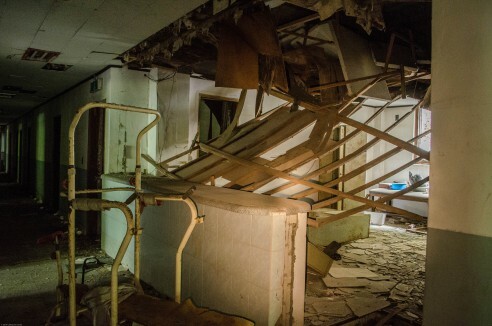 So, even if it wasn’t the case, it definitely looked like the hospital was abandoned in a hurry, thus lending credence to the idea the hospital was overrun with ghosts. And since this was a former psychiatric hospital, you know that any ghosts that could reside here would be even creepier, because they would be the ghosts of former, mentally ill patients. 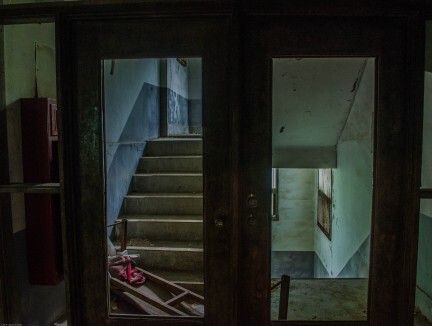 Undoubtedly the first floor was the creepiest for me to explore, because it was darker and disheveled. The farther down the hallway I went, the darker it got. I was acutely aware I was alone and every sound was heightened in my senses. 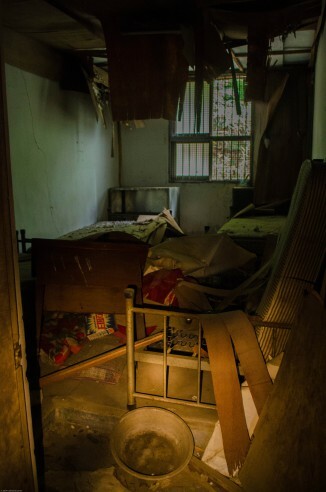 Even if I didn’t think there were actual ghosts that would attack me, I kept thinking of live serial killers lurking in the rooms waiting to jump out and kill me. It’s one of those times I felt rather vulnerable and did feel like I was in a horror movie. I kept looking back to the entrance way with the bright sun shining in, like if I could see the light, that would protect me against psycho killers, like the one that inhabited American Horror Story: Asylum. I went to the second and third floor, though they were not as creepy as the first. Higher floors had more light, so it didn’t feel quite so spooky. Most of those rooms were also empty, so it just felt like I was in an empty building. I did get genuinely spooked a couple times, because I ran into the local cat. 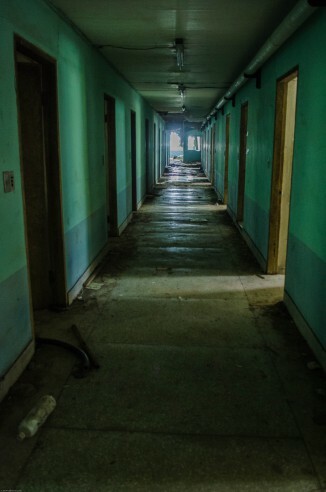 I mean, when you are in a creepy, abandoned psychiatric hospital, you do NOT want to hear unfamiliar noises that sound like someone is walking in the same building as you. The hospital ends in a roof that opens up to the lush view of the forest around me. The whole setup is in one of those rural looking areas that are within walking distance of the town. Once I satisfied my ghoulish curiosity, I crawled out from where I came and walked back to town to catch a bus back to Seoul. All in all, it was a satisfying trip. Now, of course, the most important thing: how to get there. There is more than one bus that goes from Seoul to the town of Gonjiam. As I stated earlier, I chose to take 1113-1 bus from Gangbyeon Station, Exit #1, because it was the most convenient for me. 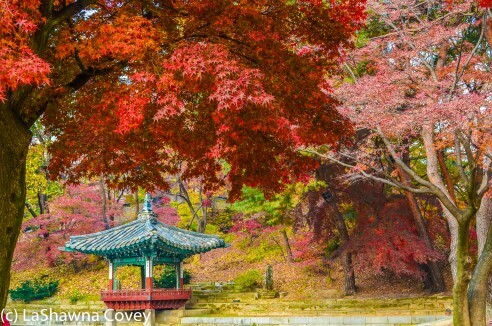 But there are other buses that go to the town of Gonjiam, like Bus 500-2 from Gangnam Station, Exit #7, and pretty much any of them will get you where you want to go. Now, unfortunately I don’t have the exact stop to take, since I overshot the bus stop and had to backtrack back. But getting off in the center of town will make it a shorter walk. The directions I read from another blog post was” from the center of town, cross a little bridge and turn right and keep going up the narrow road. The path starts a ways up just after you pass a 2 story brick house.” Yes, that is true, though I can’t find the actual street names I wrote down when I did this trip to make it easier. So the MOST IMPORTANT thing you need for a trip to Gonjiam Psychiatric Hospital is the Google coordinates: “37.362433, 127.33474”. These coordinates were a life saver for me. Thank you smart maps and 4G cell networks. 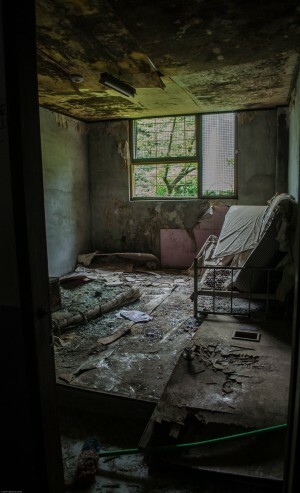 If you like creepy places, have a sense of adventure, and are in the neighborhood around Seoul, definitely take some time to visit Gonjiam Psychiatric Hospital. 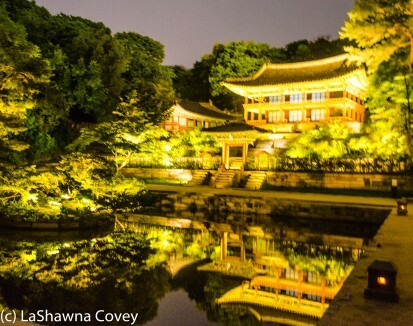 There are a few things I would consider “must do” activities if visiting or living in South Korea as an American. One of them is definitely visiting the Demilitarized Zone. It is certainly not the most beautiful thing to see in Korea, but it does show why we (as in the Americans) came to Korea over 60 years ago, and why our armed forces are still here, and we consider South Korea to be of top strategic value to the US national interests in Asia. 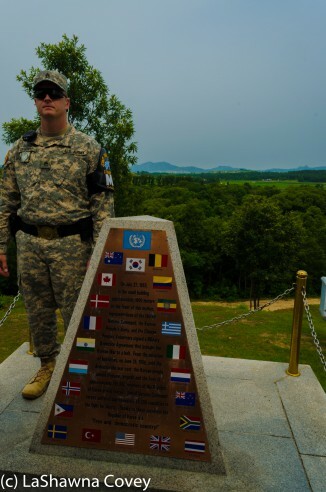 The Demilitarized Zone, or DMZ for short, stretches across all of the Korean Peninsula, bisecting it roughly (though not exactly) along the 38th Parallel where the Korean War armistice was signed in 1953. 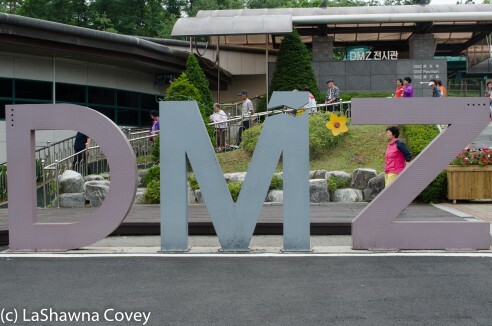 The DMZ is two miles wide and is considered the most land-mined part of the entire world, and both sides are strung with barbed wire and frequently guarded to prevent people from entering the DMZ. 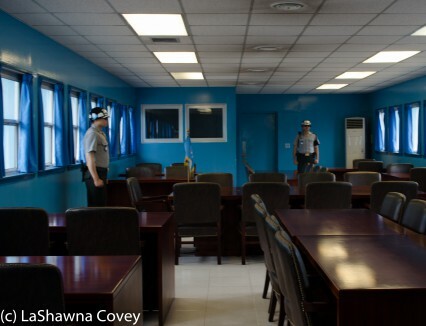 While there are different parts of the DMZ that can be visited, the easiest and most frequently visited entry point is in the west around Panmunjom, where the armistice was signed. 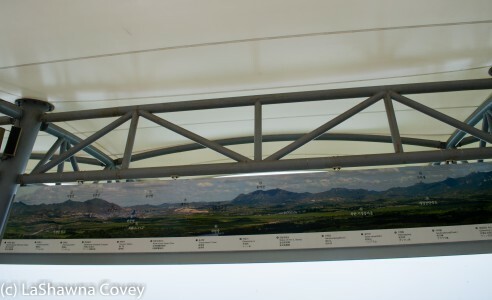 It’s a roughly 90 minute bus ride from Seoul to the DMZ, and many different tours run periodically throughout the week. 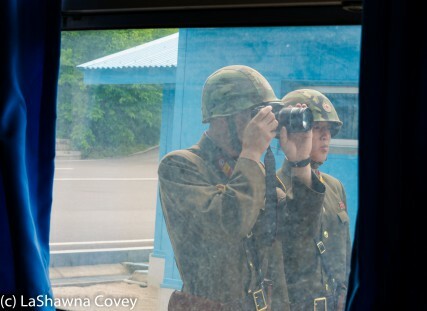 Visiting the DMZ is not something you can do independently, but must do as part of a tour group. 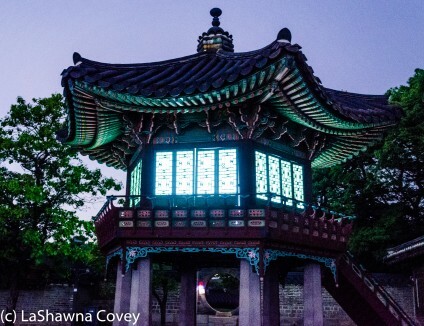 Many different tour companies offer up tours, some more closely affiliated with the US military and some run by South Korean civilian tour agencies. 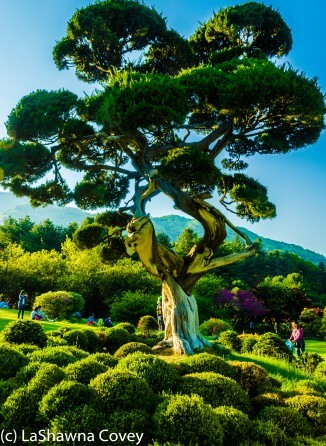 Most of the reputable tour companies’ itineraries are the same, so you really won’t get more from any one tour company. I chose to go with the USO, which operates tours for both military and civilian personnel ($40 for military/ $80 for civilians). The first stop of the tour is at Camp Bonifas, where we received an introductory speech from our “tour guides” who are active duty military from the Joint Security Area. Then we were taken up to Panmunjom itself where we can visit the building where the armistice was signed, and even briefly step inside North Korean territory. When we were in the building, we could also see a couple North Korean troops come forward by the building, taking picture of all of us. So of course we turned around and started taking pictures of them, so it was all sort of meta. 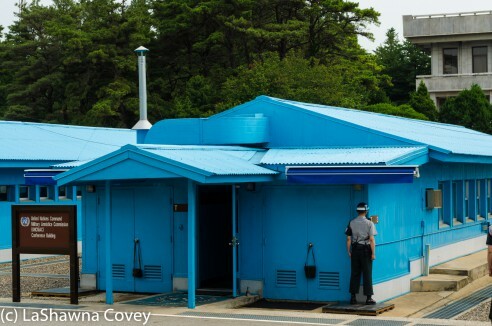 After visiting Panmunjom, we got a driving tour of part of the immediate area in the DMZ. 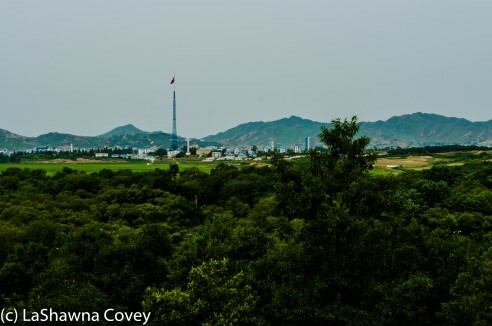 We stopped at various places, such as an overlook where we could see into North Korea and see the huge giant flag that stands over Propaganda Village. 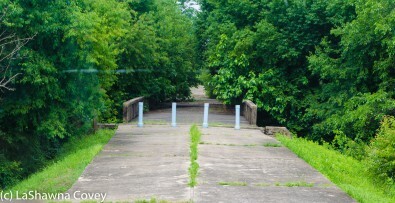 Plus we also drove by the Bridge of No Return, where POWs were exchanged at the end of the Korean War. 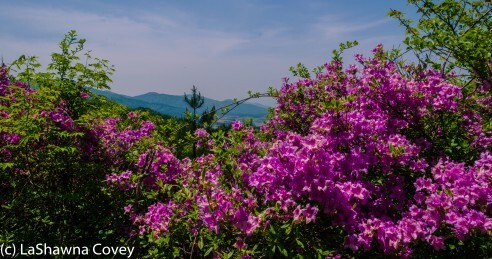 It is interesting to realize that even though the DMZ is heavily mined and guarded, it has become a sort of nature preserve. 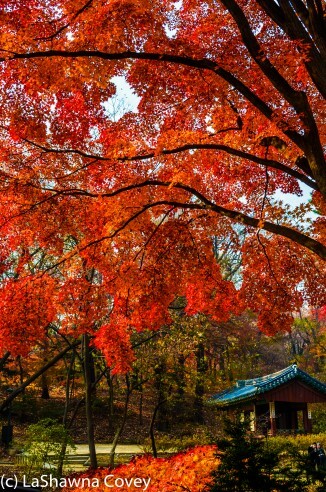 Because no humans have really stepped foot in the DMZ in over 60 years (with some minor exceptions), it has allowed nature, and particularly bird life, to thrive on its own. 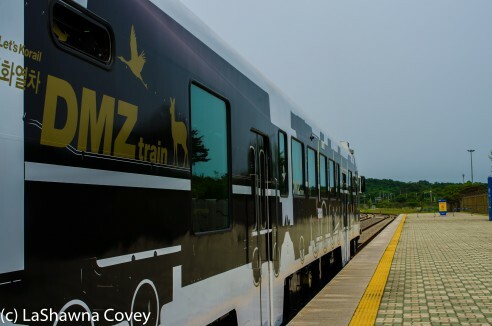 The DMZ is currently home to a wide variety of rare birds, and one day, if and when the DMZ goes away, at least parts of it might be kept as a nature preserve. 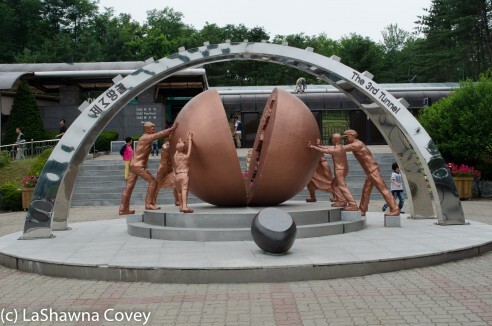 Once the DMZ part of the tour was over, we still had two more sites to visit. 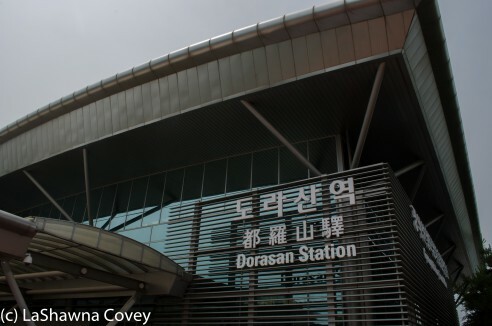 The first stop was at the Dorasan train station, which is the northernmost train stop in South Korea, and the rail line connects with North Korea. 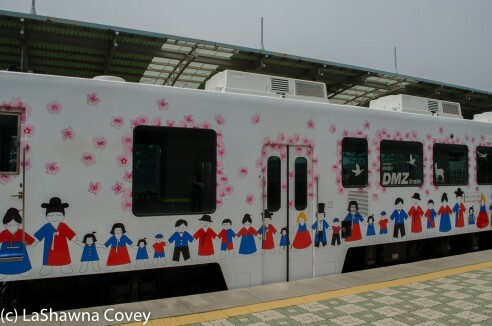 There are actual trains that leave from Seoul and head to Dorasan and return a couple times a day. You can buy a ticket for 500 won and go out onto the train platform. It’s a completely typical train station, though it was sort of funny to see the signs pointing toward Pyongyang. 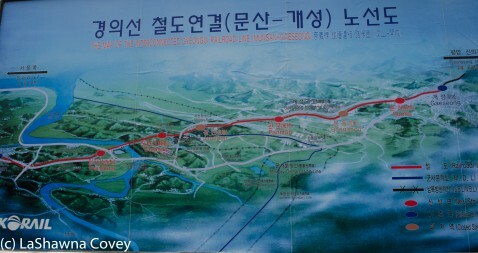 If and when the Koreas reunify, this rail line will be one of the first links between the two Koreas restored. The final stop of the tour is at the Third Tunnel. 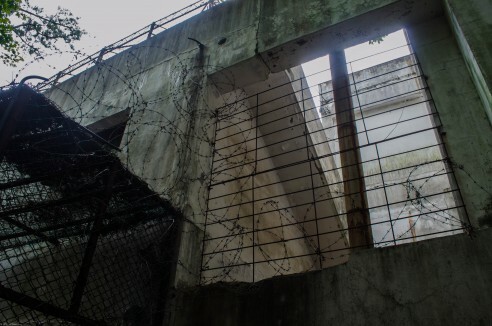 The tunnel is one of a few tunnels discovered where North Korea dug underground and opened up tunnels into South Korea as part of a secret invasion route. This tunnel is probably the best preserved for visitors. We walked down a tunnel into the actual North Korean tunnel and we could walk part of the way through the tunnel before having to turn back, because it was blocked. It was interesting to see all the different ways the ongoing conflict between North and South Korea has manifested over the years. The tour is a very full day that provides interesting historical and geopolitical information, and allows visitors a glimpse into a very real area of strategic interest. 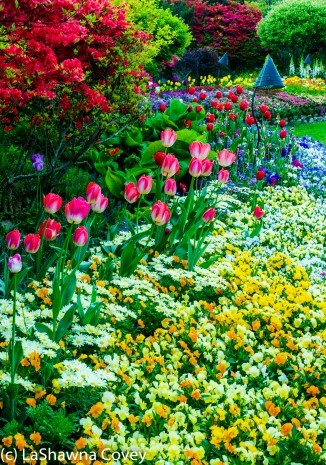 It is a very worthwhile place to visit. 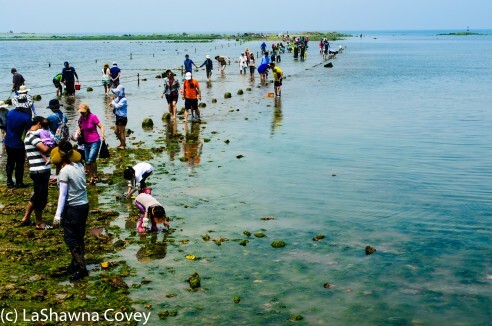 Last month, I went on another Seoul Expat Meetup Group outing to Muchangpo Beach for the sea parting event. 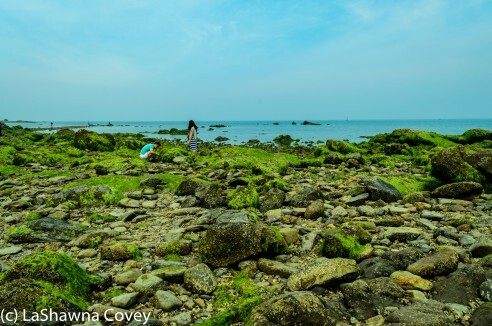 This sea parting is not the most famous one in Korea. 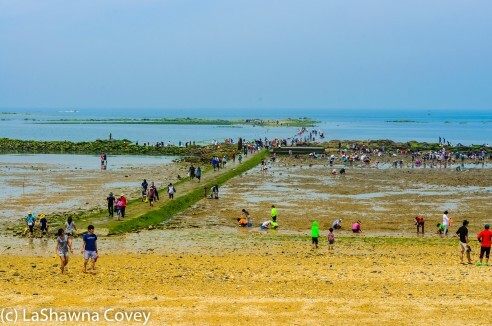 The most famous one is the sea parting in Jindo, and each year in the spring (typically March or April, depending on the lunar cycle for the year) is the annual Jindo Sea Parting Festival where for roughly an hour, the sea parts to reveal the sea floor underneath and people are able to walk across it to a nearby sandbar. 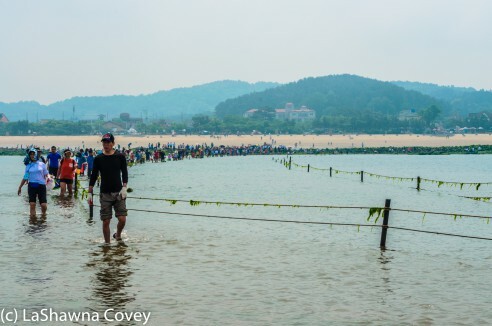 I considered going to the Jindo festival this year, but once I found out that the actual sea parting was around 0500 in the morning when it was completely dark and therefore I would have been unable to see anything, I decided not to go. 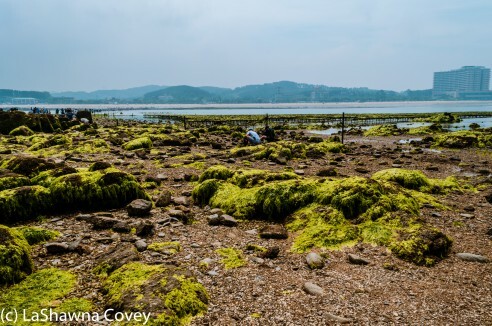 So when I saw the notice for the Muchangpo sea parting meetup, I couldn’t pass up an opportunity to see a sea parting, even if it is not the same grand scale as Jindo. 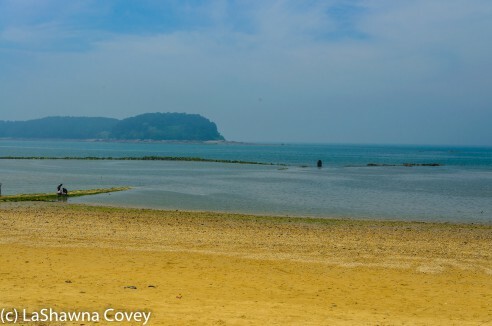 The meetup was an entire day trip down to Muchangpo Beach in the morning, and an afternoon stop at the nearby Daechon Beach. The day’s weather was gray and cloudy, but warm, and thankfully not raining. The term “sea parting” is a bit of a misnomer, and brings to mind the image of Moses parting the Red Sea. 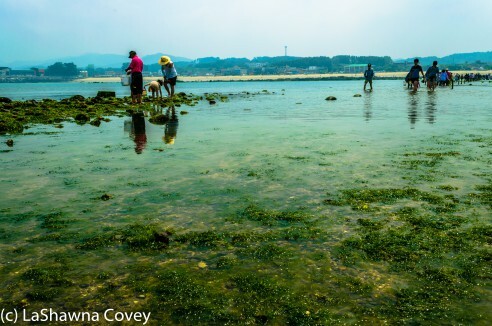 What is really going is a very extreme low tide, and in the case of Muchangpo, it is tied to the lunar cycle. 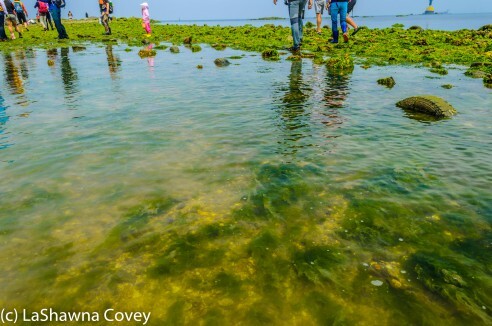 During this particular trip, the sea parting was from 1100-1200 on Sunday, June 15th. We arrived on site around 1030, and the tide was still going out. 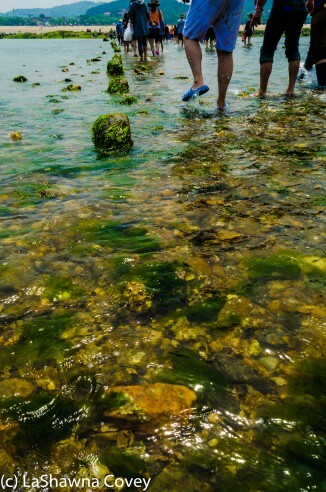 We started making the crossing at about 10 minutes until 1100, and the water was about mid calf deep at the time. 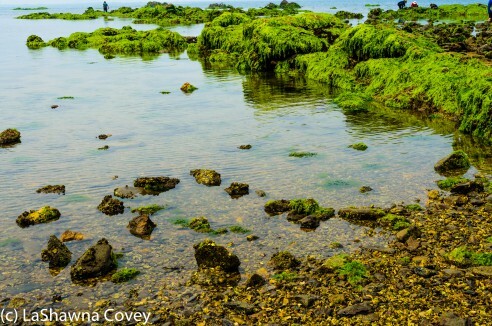 We crossed to a small rocky outcropping that was exposed during the sea parting. 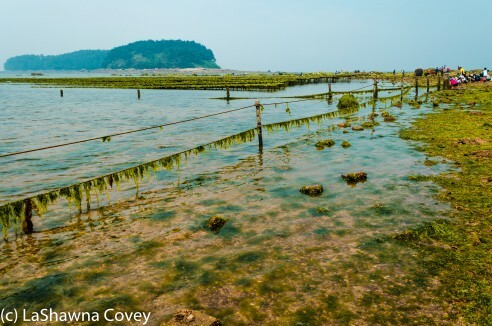 There really isn’t much to do on the tiny island (if you can call it that, since it was basically just exposed rocks), but walk around and look at stuff that is normally underwater. 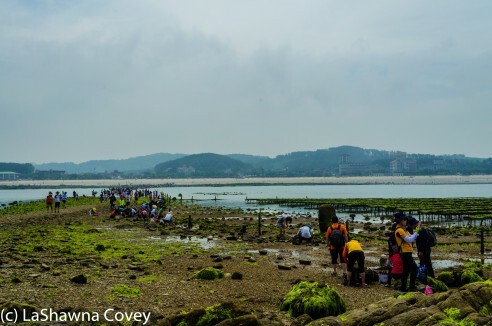 All around, there were groups of Koreans digging in the sand for all sorts of buried creatures to make into a nice meal. 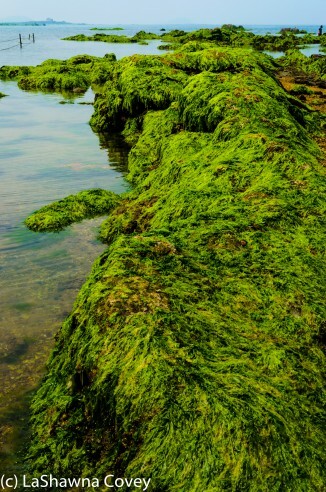 The seaweed covered many of the rocks and was a very glistening green that almost looked painted on. 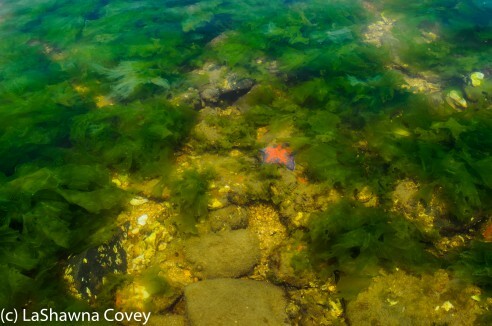 We saw a wide variety of colorful starfish just hanging out in the waving seaweed. 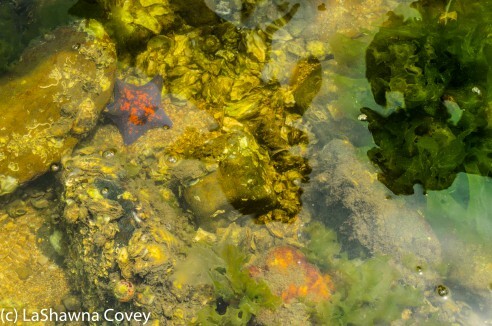 It was interesting to walk around and see stuff that is normally buried under several feet of water, and only occasionally see the light of day for a brief period. After the hour was up, these air raid-like sirens sounded with an announcement in Korean and I assume telling us to return to the beach before the tide came in. As we walked back, the water level was lower than when we headed out to sea and it was only a couple inches deep in places and the path was clearly marked with buried tires. 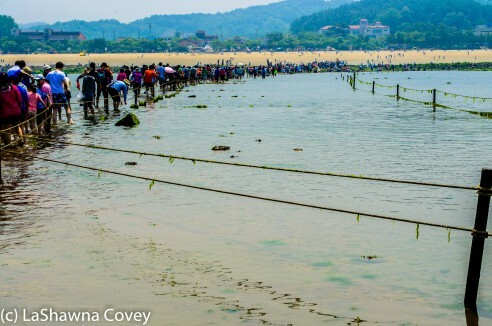 However, not that long after noon, the tide started coming back in. 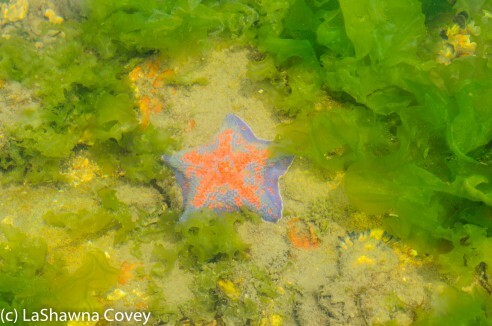 Shortly after that, everything that was exposed to us was completely covered in water again, hidden only to be viewed again during the next sea parting. 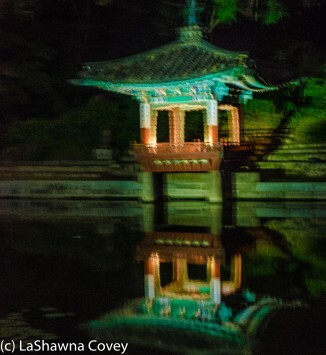 About a week ago, I had the opportunity to do a moonlit tour of Changdeokgung Palace. 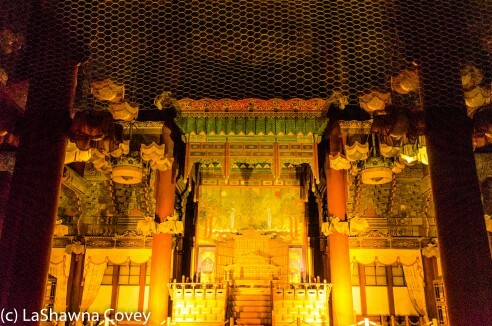 I had visited the palace the past fall, but this was an opportunity to see the palace in a new light (literally). 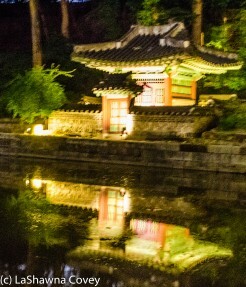 During this year from April to November, the palace offers up moonlit tours twice a month, on the full moon and one day next to it. 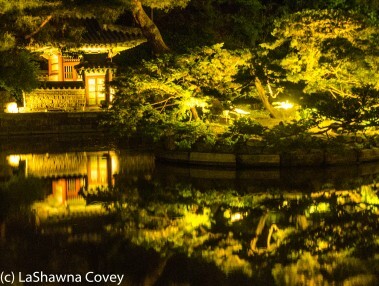 I love evening tours, and figured this would be a good opportunity to do some night photo shooting as well. The tour started at the main gate at 2000, at which point, it was almost completely dark. Luckily for us, the weather was good, though a tiny bit hazy, so it wasn’t a perfectly clear moonlit night. At least it didn’t rain though. We were taken through parts of the palace grounds, from the main hall, to different out buildings. We didn’t actually enter any of the buildings, but we were able to look inside. We had lanterns to guide us on the trail, which was convenient for some of the stairs. 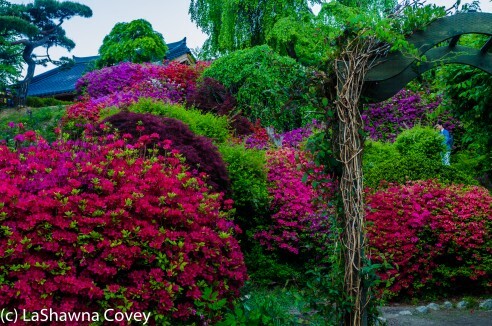 After seeing some of the buildings, we were taken back to the Secret Garden. 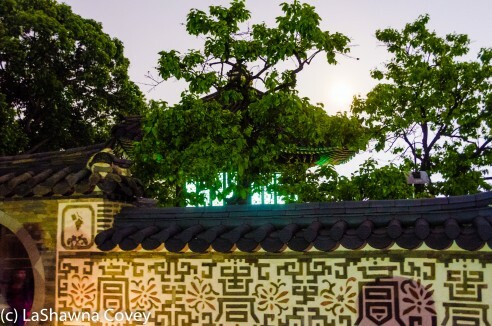 We didn’t see the full tour of the Secret Garden like I did during a day tour, but the most scenic places of the garden, like the Buyongjeong Pavilion were shown. 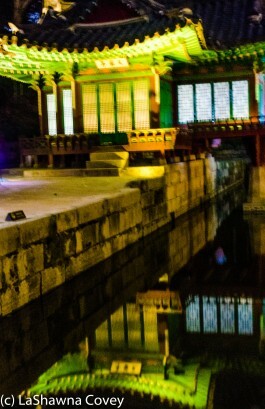 All the buildings were very lushly lit and it was made for some nice photography. The actual walking tour of the grounds took about 90 minutes, and the last 30 minutes was a sampling of cultural performances. 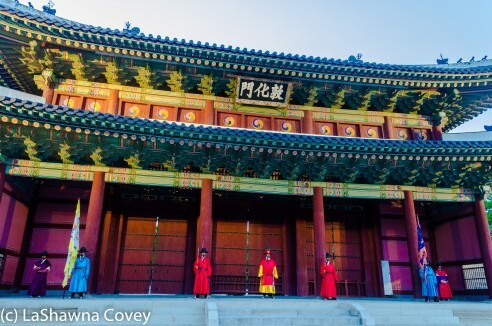 We were treated to a variety of Korean dance, opera and traditional music in an open air setting, so it was pleasantly cool by this point in the evening. 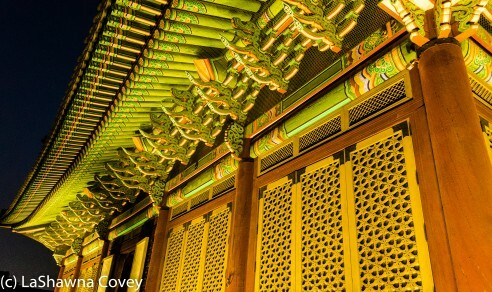 It was a good opportunity to see different aspects of Korean culture you might not be able to see. We were also given some traditional Korean tea and sweets to enjoy the performance. This tour is geared more toward cultural awareness rather than photography, which is why tripods are specifically banned in the advertisement for the tour. However, in my group there were numerous people who brought and used tripods and the tour guides did not prevent anyone from using them. 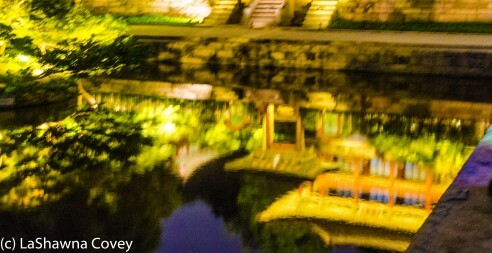 I know my pictures would have turned out better if I had brought my tripod. This is not a tour open to just anyone. 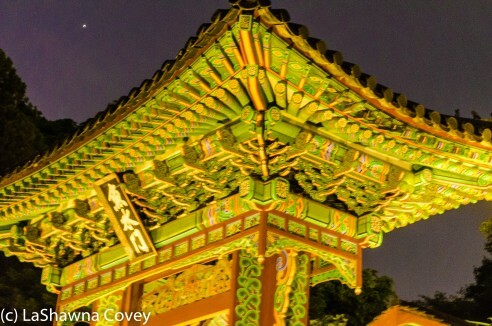 This is a tour just for foreigners, so no Koreans are allowed to attend. Three languages are offered for the tours: English, Japanese and Chinese. The tickets are easy to buy online through Interpark, and you pick up your ticket at the venue after 1930 the day of the event. Tickets cost 30,000 won per person, and I believe one person can reserve two tickets at a time. Make sure you bring some form of an ID, such as a passport to prove your identity when you check in at the palace. The total tour lasts around two hours, so figure you will spend 2000-2200 in the evening there. 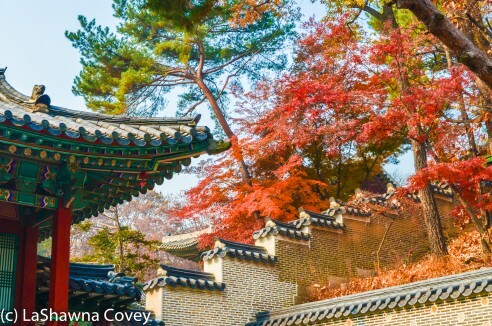 Changdeokgung Palace is easily reached from metro line 3 (Anguk stop, exit 3), and it is a few hundred meters up the road, or you can walk to the palace from metro stop Jongno-3(sam)-ga (Lines 1,3,5, exit 7). 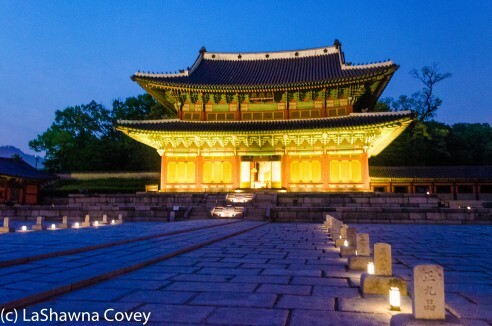 If you like moonlit tours, particularly of palaces, and would like to see a different aspect of Korean culture, I highly recommend the tour. 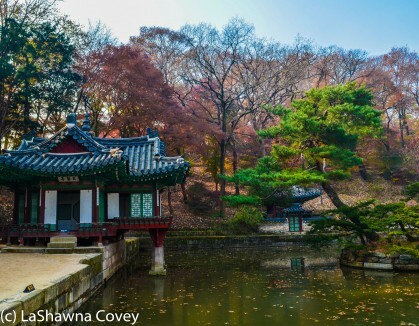 Last fall I took my mom to visit Changdeokgung Palace when she came to visit Korea. 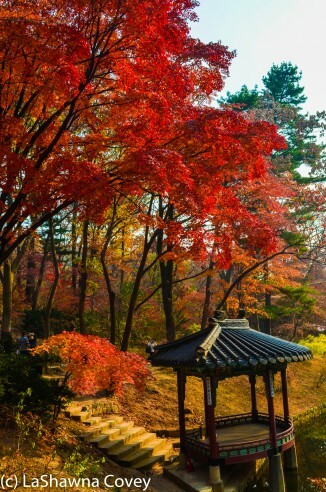 I had visited the palace on a previous tour, but not during fall. 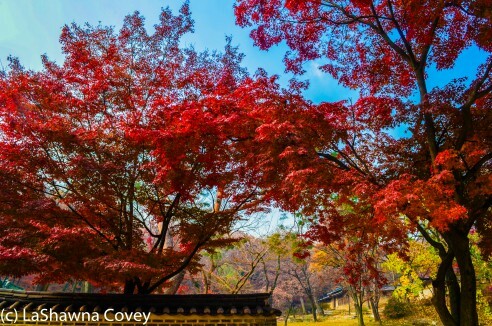 At the time, the fall leaves were just a bit past peak color, but they were still vibrant enough to make you stop and stare. 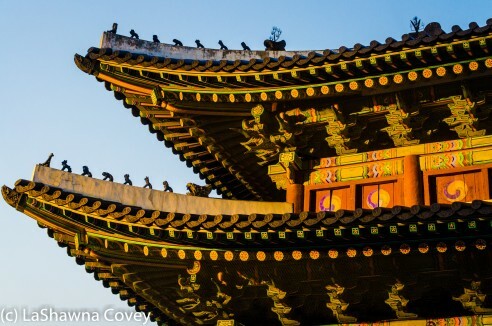 We got to the palace relatively early, because we had a full day planned of palace visiting and walking around Seoul. 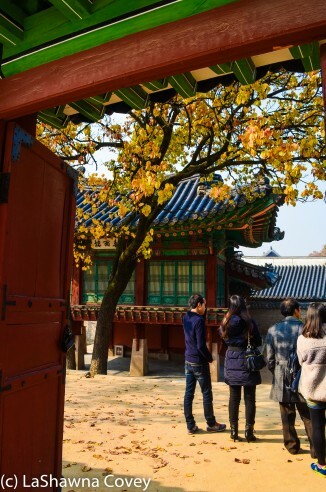 We first did the Secret Garden tour, which is to the rear of Changdeokgung Palace, and actually makes up the bulk of the complex. 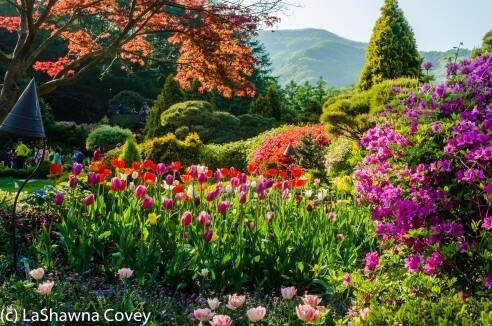 You can only access the garden via a guided tour, of which there are multiple ones throughout the day, in both Korean and English. However there are only two tours in English, at 1130 and 1430. 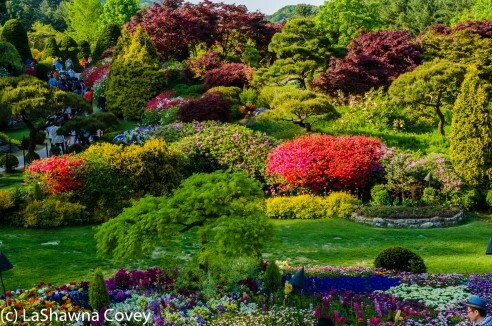 The garden was designed for the private pleasure of the king and his family. 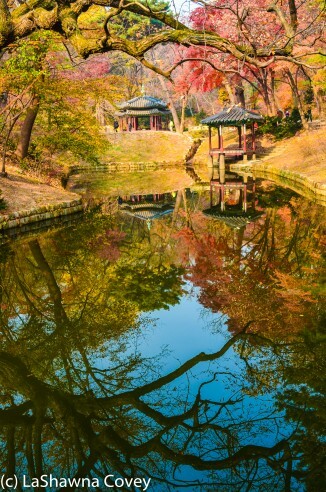 It has a wide variety of buildings, gardens, ponds, flowers, and trees, some of which are hundreds of years old. 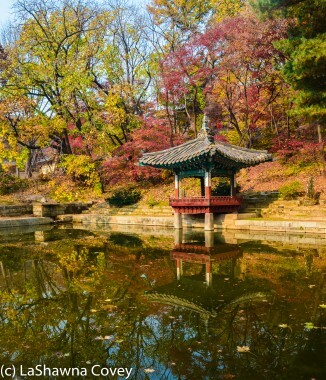 The highlight of the Secret Garden tour is the Buyongjeong Pavilion on the Buyongjeong Pond, which was restored a couple of years ago. 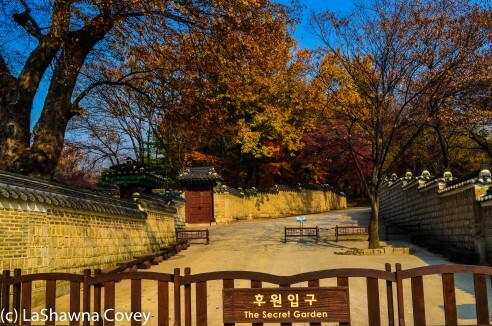 The tour of the Secret Garden lasts about two hours, and it moves at a leisurely pace. 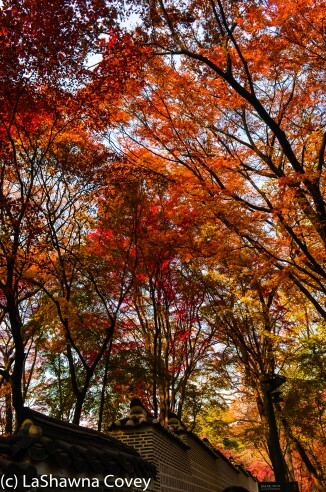 You definitely have plenty of time to enjoy the scenery, listen to the tour guide and take pictures. 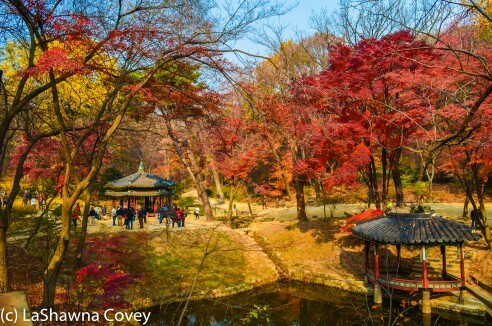 This was definitely one of the most beautiful places to see in Seoul in the fall. 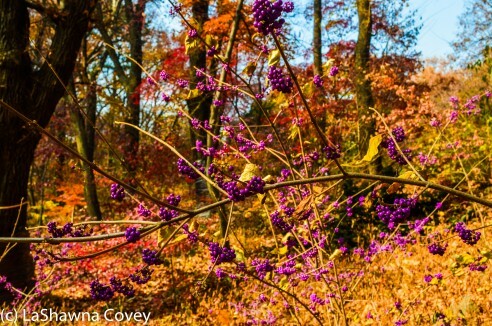 There are many places that have colorful leaves, but the Secret Garden has some of the greatest concentration of fall beauty. 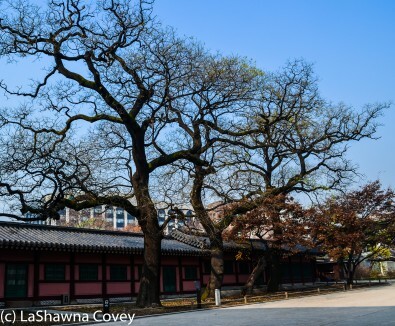 Changdeokgung Palace is easy to get to, since it is centrally located in Seoul. 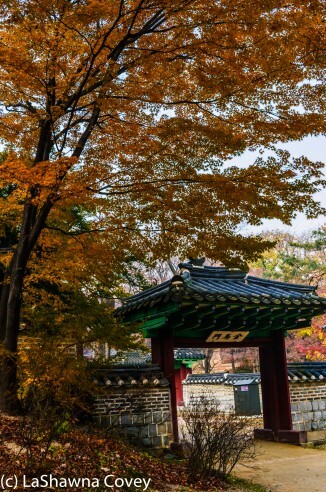 You can reach it via metro line 3 (Anguk stop, exit 3), and it is a few hundred meters up the road, or you can walk to the palace from metro stop Jongno-3(sam)-ga (Lines 1,3,5, exit 7). There are separate English language tours for the palace (though you can walk through most of the palace grounds on your own) and the garden (guided tour required). It is open from 0900-1700 (winter) or 1830 (summer). 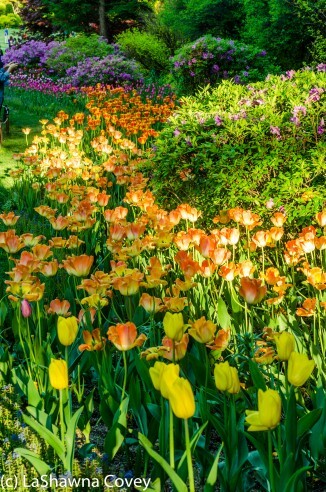 If you like palaces, and especially if you love beautiful gardens, this is definitely a palace to visit. 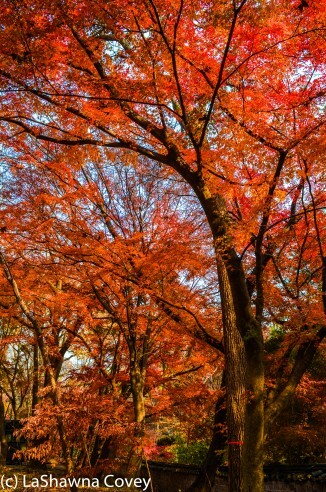 And if you have the opportunity to visit it in the fall, that is even better. 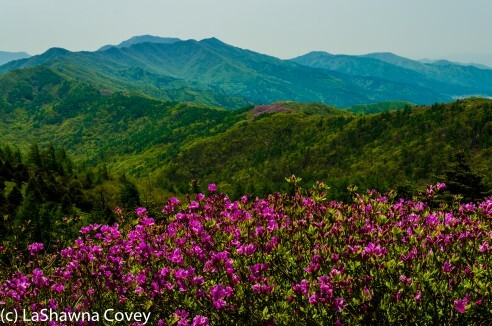 A couple weekends ago, I finally was able to go on the Baraebong Peak Royal Azalea hike in Jirisan National Park. I read about this hike last year, but wasn’t able to do the hike. 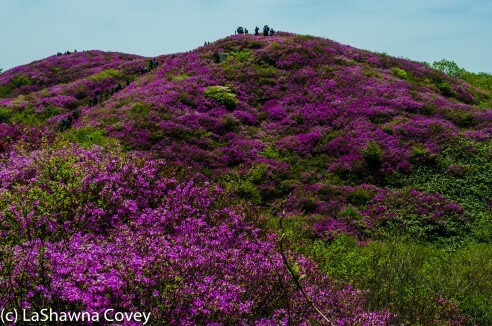 Since this year is my last spring in Korea, I knew I really needed to do this, because the pictures I’ve seen of this hike are absolutely beautiful. 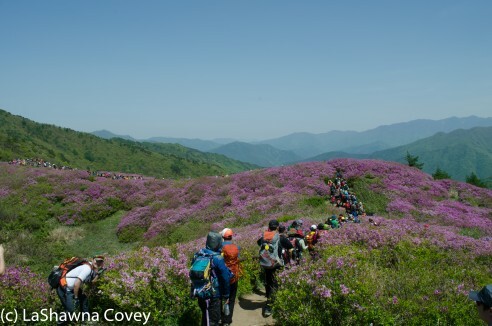 Luckily for me, in my online searches about this hike, I discovered the Seoul Meetup group that was planning to do this hike, and I eagerly signed up. After signing up, I realized that the hike the meetup group does, is only a short version of the hike. 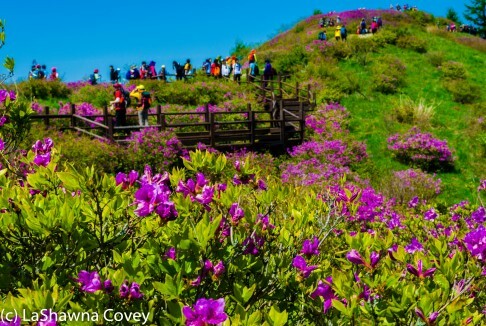 The true hike is the Jeongnyeonchi Hill Baraebong Peak Course. 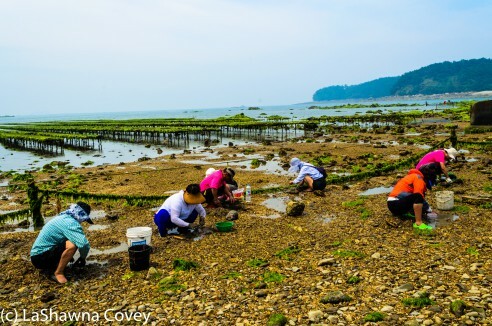 It starts at the Jeongnyeonchi service area and ends at Undong village. 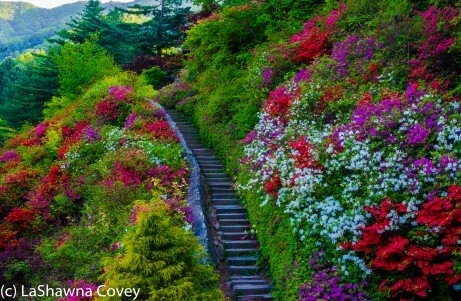 That hike is about 12.6 kilometers, and most of it traverses a ridgeline and passes through numerous passes that are covered in colorful azaleas. 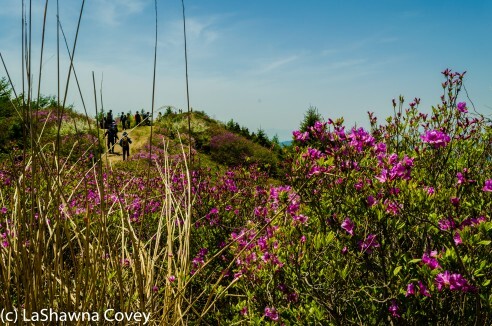 Unlike most hikes I have done in Korea, that hike has very little in the way of steep inclines, and the one steep decline is at the end of the hike. The shorter hike we did started at Undong village and continued up the hill to Baraebong Peak with a diversion to Pallangchi Pass, with a return to Undong village. The hike we did was around 8 kilometers. This hike was also the steepest part of the whole hike. 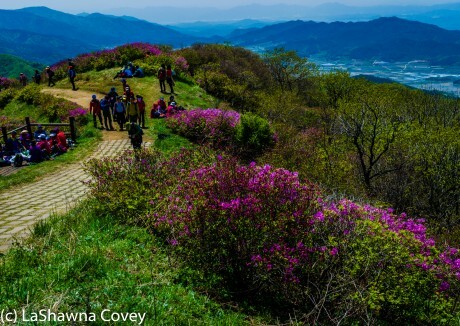 The hike starts at Undong village and ascends sharply to Baraebong Samgeori. The altitude gain on this hike was over 400 meters in a brief period of time. I was definitely feeling the hike in my legs. It was in the middle of the day, and the sun was bright and overhead. There was only minimal shade on this hike, but I took advantage of it whenever I could. 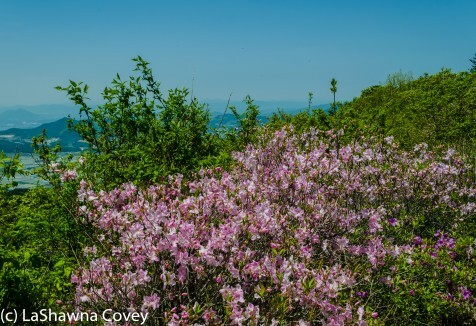 Surprisingly, all of these spring hikes I’ve done this year have felt easier than the fall hikes I did. I’ve actually been passing Korean hikers on the paths. My knees certainly feel better. I would like to think that I am simply fitter now than I was in the fall. Or maybe I am just missing all the fitter Korean hikers. But the more likely answer is that I’ve been hiking on easier paths. Sure, the trails are steep, but the trails are wide and surprisingly well-benched. At times I even felt like I was hiking in New Zealand. 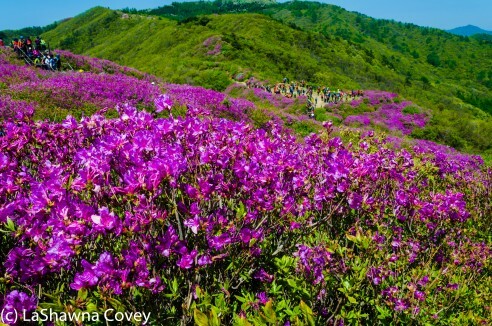 This hike is very popular, particularly this time of the year. 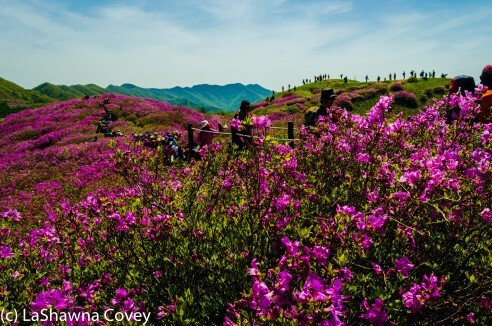 There were scores of tour buses at Undong village, and even more groups hiking in from Jeongnyeonchi pass. This popularity is probably why the trail is so well benched, but it also means it is VERY crowded. For most of the trail, that is not really that big of a deal, but parts of the trail around Pallangchi pass are rather narrow, so there were times a long line formed on the trail. 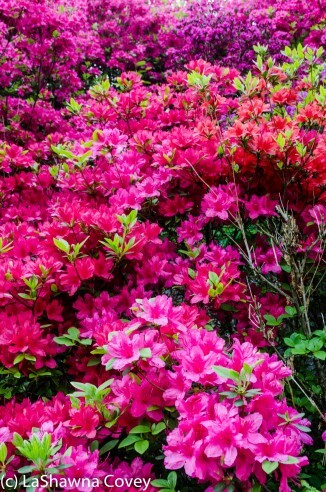 Sure that make the walking slower, but this also allowed a greater opportunity to take in the beautiful azaleas. 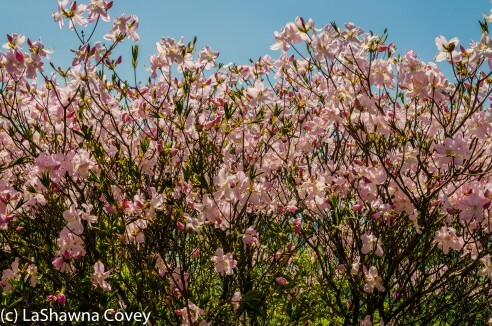 The azaleas at lower altitudes already passed their blooming season, but as I ascended in altitude, there were more and more azaleas on the path. 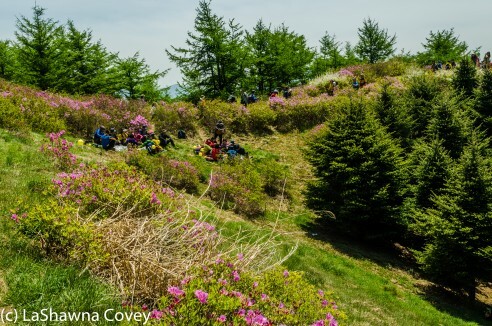 Once I reached Baraebong Samegori, I ascended to the top of the peak. Most of the trail was relatively flat, but the last 250 meters before hitting the peak were so steep, but the view from the top was worth it. 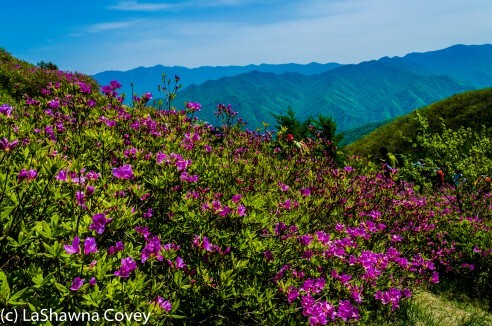 I could see all the surrounding mountains, and I could see further down the trail, where the patches of azaleas were abundant around Pallangchi pass. I had plenty of time before having to return to the bus, so it was a pretty easy walk out to the pass. Pallangchi pass was definitely worth the walk. 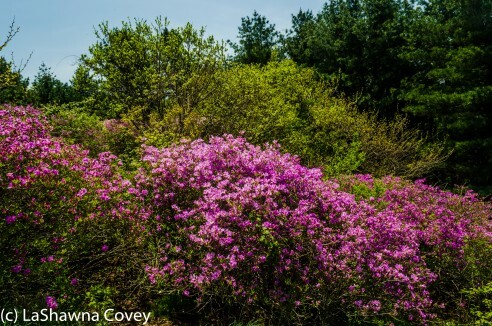 All around the areas were thousands of bright purple azalea flowers. 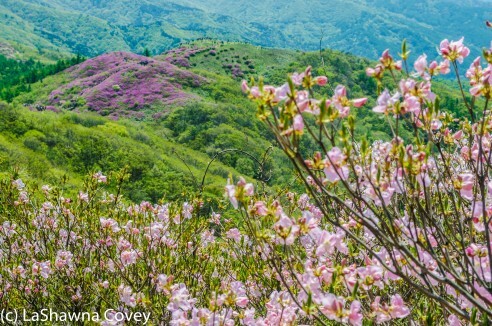 The hills were fields of pink, and I had never seen anything quite like it. 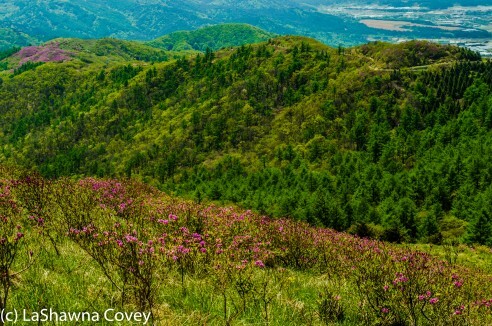 Independent travel for this hike is not exceptionally easy or cheap, but it is doable. 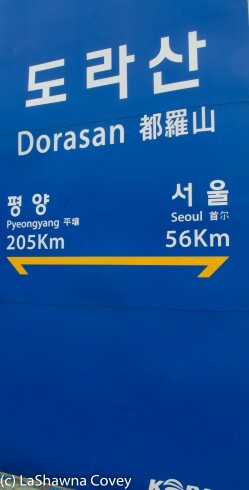 The quickest way is probably to take a train from Yongsan to Namwon station, and then a taxi to Jeongnyeonchi service area. At the end of the hike at Undong village, there were plenty of taxis waiting, to get a ride back to Namwon station. There really aren’t any buses in the area, so you really have to take a taxi or be part of a tour group. If you have the opportunity to do this hike, I highly recommend it. 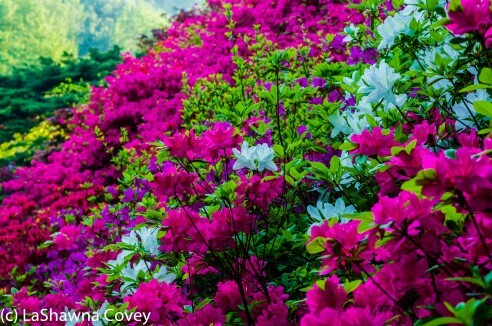 I have never run into the opportunity to do a hike that afforded an opportunity to see so many wild, colorful azaleas in one place. 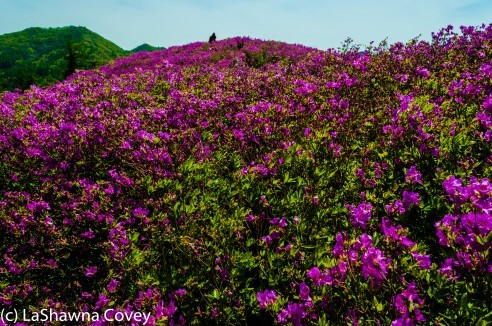 Parts of the hills were all pink, and even the parts that aren’t, offer up so many beautiful views of the surrounding Jirisan National Park. A couple of tips for this hike. 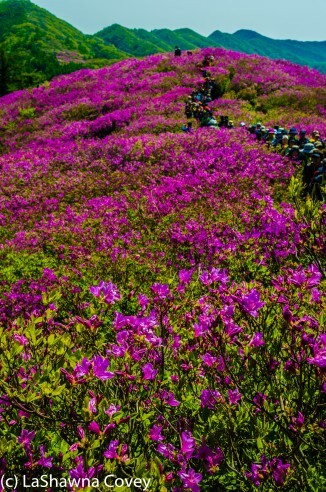 If possible, I would highly recommend you start this hike early, particularly if you are doing the full 12.6 kilometers. 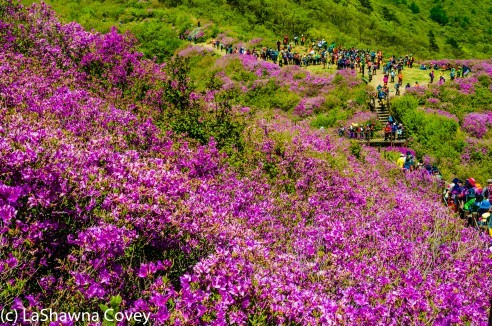 This will hopefully allow you to get out in front of the bulk of the Koren hiking groups, though there will be the really dedicated hikers out there. Definitely take plenty of water, sunscreen, a hat and sunglasses, because the bulk of the hike is very much exposed, and the sun will beat down on your head during a sunny and bright day. 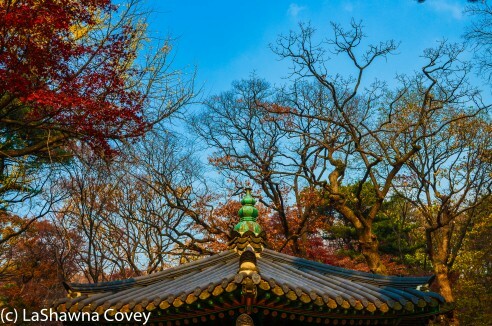 The second half of my day trip to Nami Island was a visit to the Morning Calm Arboretum. 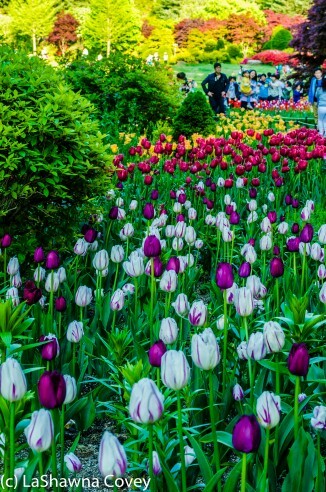 I had visited before a year ago for the winter Lighting Festival, but wanted to see it in the full light of the spring blooming season. 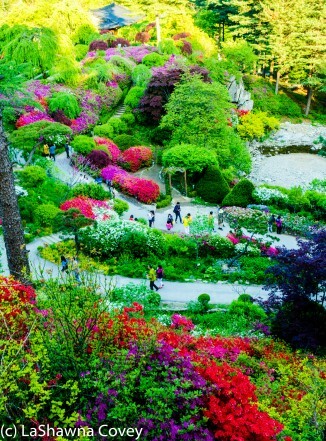 It is actually reasonably easy to combine the two places into one day trip. 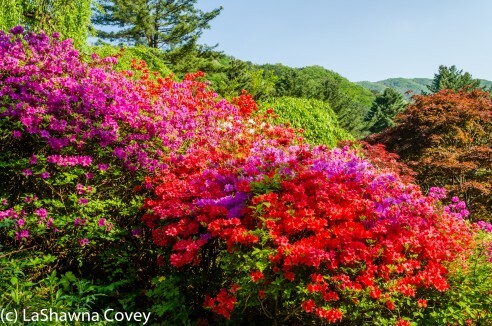 They are linked by the Gapyeong Resort Shuttle Bus that runs from Gapyeong Station to Morning Calm Arboretum on an hourly basis, and it takes a little over an hour to get from Nami Island to Morning Calm Arboretum under normal traffic conditions. I was done with Nami Island by noon, so I figured I would hit the arboretum by 1330 and be on the train back to Seoul by 1700. Well…that was the intention anyway, but the reality was far different. The next shuttle bus was due at 1215, but over an hour and a half later, that bus still had not arrived. Finally a bus did arrive, and I got on it, but it only went as far as Petit France, which is a fake French theme park between Nami Island and Morning Calm Arboretum. Eventually a bus did arrive, and I figured I was home free to get to the arboretum and enjoy a couple hours of viewing before heading home. Again, that was the plan. However, this was a day when the bus ran into the absolutely horrific Korean traffic in places. Due to the VERY long line to get a parking space, it took the bus well over an hour to arrive at the arboretum. 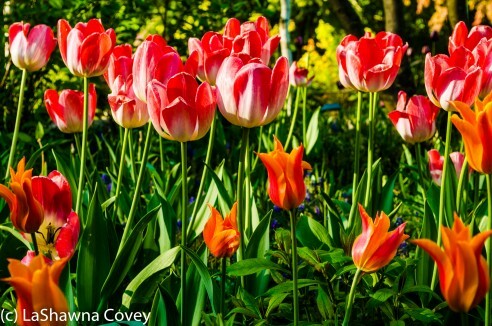 By this point, I had about an hour and a half to enjoy the flowers before having to catch a bus back. After all this waiting (which isn’t something I am particularly good at) in the hot sun, my mood was a bit surly, and wasn’t helped by the hordes of crowds at the garden. 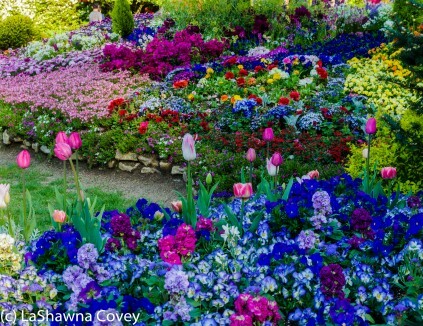 But once I was able to relax and take in all the colorful flowers, my blood pressure stopped dropping. The one upside to this extended delay is that I missed the harsh overhead sunlight in the middle of the day, and instead was treated to the softer, more attractive light from the setting sun. 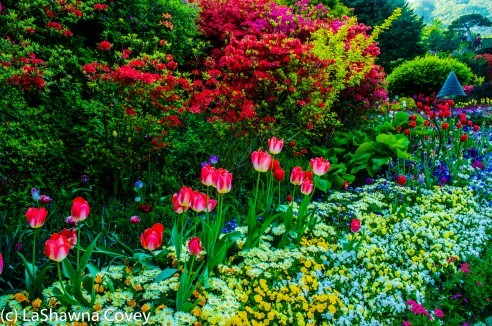 I still wish I had more time to enjoy the garden, because there were so many beautiful flowers. 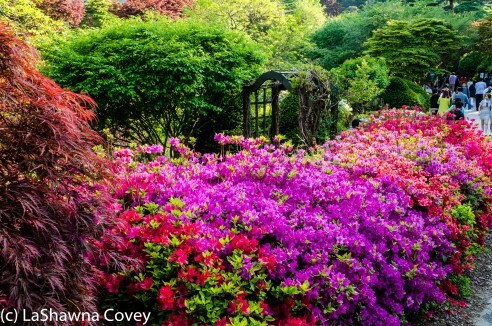 The azaleas were about at peak bloom. 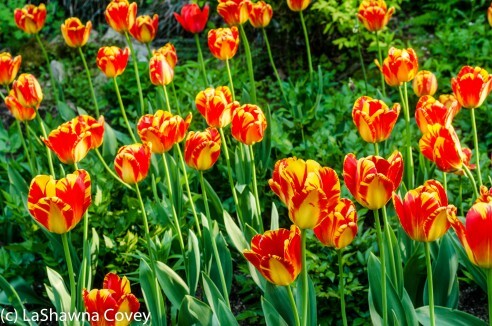 The multi-colored tulips were throughout the garden, and a wide variety of other wild flowers was interspersed throughout the gardens. 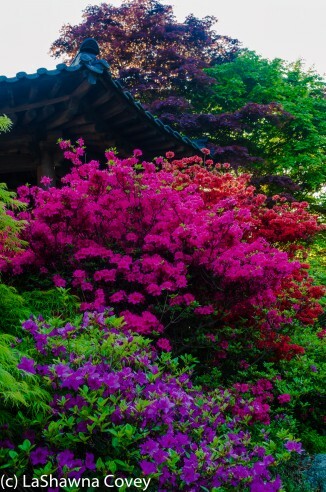 The arboretum is a very beautiful place to visit, though you will definitely have to fight through the considerable crowds in the afternoon.If I had to go again, I would go in early morning right when it opens around 0830. 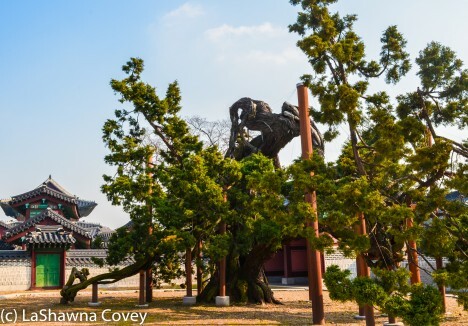 I’ve found that the best time to visit any popular place in Korea is in the morning, because crowds don’t tend to show up until late morning/early afternoon. Getting back to Seoul from Morning Calm Arboretum is pretty easy. There is a bus that leaves on the hour heading toward Cheongpygeong Station, which is a stop on the metro line and the ITX line back to Seoul. 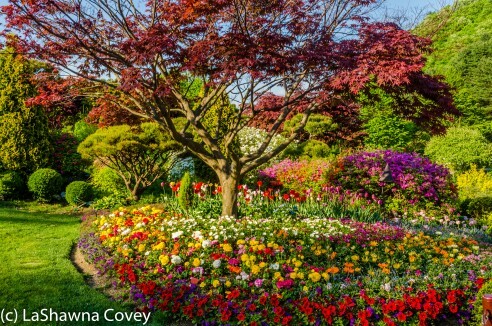 If you love beautiful flowers, this is definitely a great place to see them.